The Ferrari of swords. Rapiers and their various incarnations are the most sophisticated form of the sword, adopted by gentlemen and movie stars everywhere. An excerpt from Strongblade Lore, The Rapier. This 19th Century sabre is designed for stage combat. A military style sabre which is durable enough for sports fencing. This is durable foam sword deigned for LARP(Live Action Role Play). 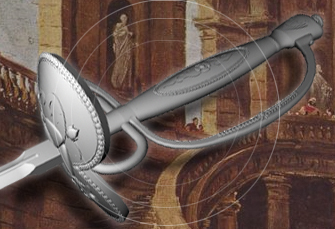 Its is like a medieval long sword, but the hilt is all Renaissance Spain. This group of swords is one of the most confused of all the different classes. Most of these swords are usually classified into one ambiguous lump under the term "rapiers," but in actuality, they were very distinct groups of weapons. The rapiers and small-swords were swords carried mostly by civilians, and were used almost exclusively in duels or for self-defense. Cut-and-thrust swords were a more military sword, used to combat slower, heavier knightly swords. Although the term rapier has become synonymous with any narrow-bladed sword (particularly those with fancy hilts), the term rapier actually applied to only a select few types of swords. 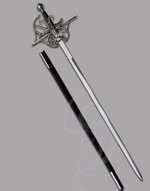 Rapiers were narrow (usually one and a quarter inches wide), quite long, fairly heavy, and usually had only a slight edge on them. 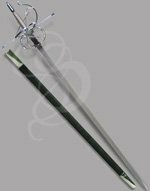 The extremely long length of the rapiers made them a bit heavy and cumbersome, not at all the Errol Flynn or Zorro-type small-swords that most people think of. 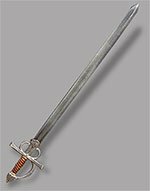 Although early rapiers did have sharp edges, the sword was meant almost exclusively as a thrusting weapon. It is theorized that the sharp edges on early rapiers were used to discourage opponents from grabbing the weapon with their off hand, although there is some evidence that the edges also allowed the sword to slide into a body more easily. And that's really what it's all about isn't it? 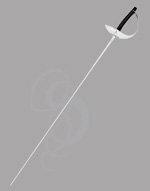 That said, there is also evidence that early rapier wielders did use the edges to slash, but the type of rapiers they used were probably closer to their side-sword cousins than to the rapier in its prime. A rapier was used almost entirely for offense when it was first introduced (in the 15th century). If a rapierist was going to parry, he or she would use a parrying dagger in the left hand, or perhaps a small buckler shield. As the weapons became smaller and more agile, parrying with the blade was introduced. This meant much more contact with opponents blades, and, as anyone who did any amount of broomstick fencing when they were kids knows, quite a few hand wounds. Because of this, elaborate crosses (metal guards perpendicular to the blade) and rings were developed to help protect the hand. These protections evolved and became more elaborate, culminating with spiraling crosses and beautiful swept hilts. Later, swordsmen went to a more practical, if less aesthetic, cup hilt. This was a small, curved metal disk at the top of the hilt, just above the cross. 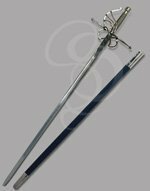 The term rapier has been used to describe all of the swords in this category at one time or another, and is fast becoming a catch-all to light swords in general. The term is believed to have come from the Spanish/Italian word "ropera" meaning clothes, being a "sword that is worn with clothes," or a "dress sword." Somewhere between knightly swords and rapiers were the hybrid side-swords (or sometimes called cut-and-thrust swords). As the name implies, these weapons could be used to slash or to pierce. They were exceptionally good at jabbing into weak spots in opponents armor, but were also capable of quick, devastating slashes. The relative speed of the weapon (when compared to arming- or battle-swords) allowed a combatant to disable or kill his opponent quickly. Picture this: A soldier wearing a mail shirt and wielding a hand and a half sword rumbles toward you. The preparation to his attack brings the sword up above his shoulders, then down and across his body, with the momentum of the sword swinging it all the way to the ground. If he connects with this blow, There"ll be two of you, but if you were to step in quickly while his sword was held high, and deliver a stop-thrust or two quick slashes to the face, legs or neck, the combat may be over before your opponent has even swung once. This was the concept of the cut and thrust sword. It didn"t always work, of course, but it was this style of thinking that eventually led to the rapier and small swords of Hollywood fame. In fact, the term "Swashbuckler" came from the side-sword. These swords were often used in one hand, with a buckler (small shield) in the other. The sound of the sword "Swashing" through the air, combined with this penchant for the bucker shield gave way to the nickname "Swashbuckler." It supposedly was not an endearing term. Cut-and-thrust swords were still fairly heavy " any sword used for slashing really needs to have some heft to make the cut effective " but they were far lighter than the massive battle swords or even the one-handed arming swords. These sword continued to evolve well into the 19th century and were used in military encounters even as late as the civil war. These are the swords that many people generally think of when they hear the word "rapier." Fairly short, light, and having only a rudimentary edge or no edge at all. These and the dueling swords are the weapons closest to our modern day fencing foils and epees. Hollywood loves the small-swords; Errol Flynn, Zorro, and the Three Musketeers have all been depicted with some form of small-swords. The light-weight small-swords allowed much faster swordplay, what is known as "double-time" fencing; quick attacks and counter-attacks and fast paced movement. With this type of weapon, a combatant didn"t need a parrying dagger or buckler. Parries were executed with the forte of the blade (The portion of the blade nearest the hilt), and ripostes (counter-attacks launched after a parry) were blazingly fast. Small-swords were the basis for later "Court swords," which were mostly ornamental swords worn by the for fashion instead of combat. Although small-swords were used for dueling, they should not be confused with dueling swords, which were used almost exclusively for duels. Dueling swords had absolutely no edge; they were used only for thrusts against an opponent. Dueling swords were often cylindrical, although there were also versions with rectangular cross sections. These swords were the direct descendants of modern fencing foils and epees. 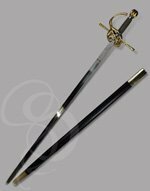 Both small-swords and dueling swords were the penultimate dueling weapons "they could be carried easily at all times and were graceful enough to be used by the upper classes. In fact, the use of the small-sword was considered an important part of a gentleman"s education.